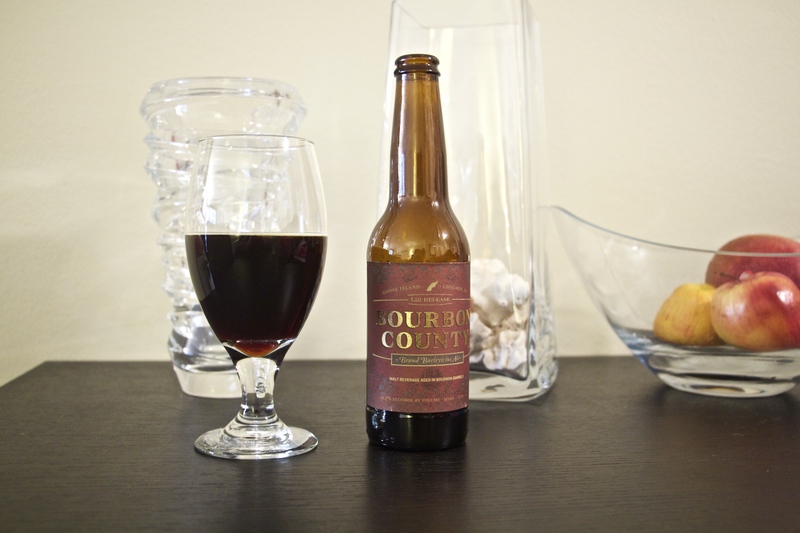 It’s that time of year again—Bourbon County time! 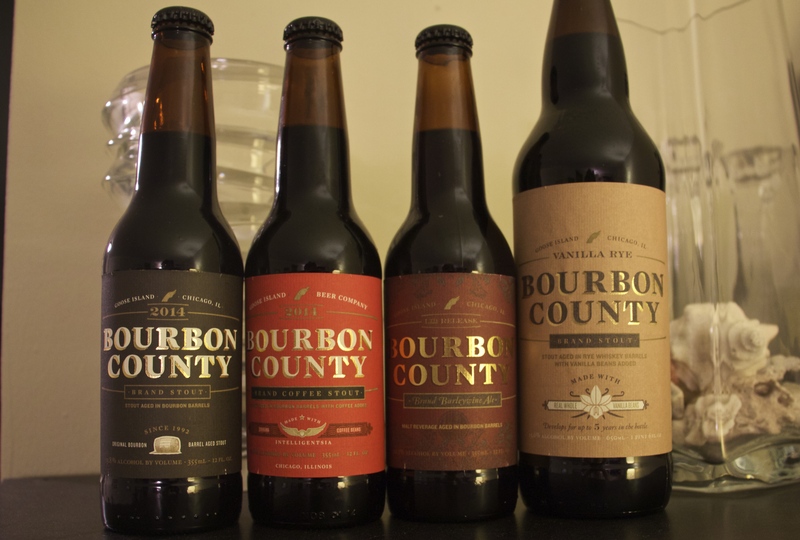 And this year’s 2014 Bourbon County line-up does not disappoint. Before we get to the reviews, we’d like to thank Goose Island and their great media team for sending us samples to taste and review ahead of the release. Hot off a killer 3rd Anniversary Party last week, One Mile House (10 Delancey Street) will have almost a dozen Goose Island taps, including several 2014 Bourbon County stouts and some of the Goose Island wild ales on Wednesday, November 26. Click here for the details. After you’ve stuffed yourself with turkey and beer on Thanksgiving, come out out early the next day, Friday, November 28, to Top Hops‘ (94 Orchard Street) Black Friday event. There will be doughnuts and coffee for people waiting in line starting at 7 a.m., along with some special Bourbon County gifts for those who show up earliest. Click here for details. The Original, a liquid as dark and dense as a black hole. The nose is an intense mix of charred oak, chocolate, vanilla, caramel and smoke. One sip has more flavor than an average case of beer. Available nationally in four and 24-packs in 12-ounce bottles. 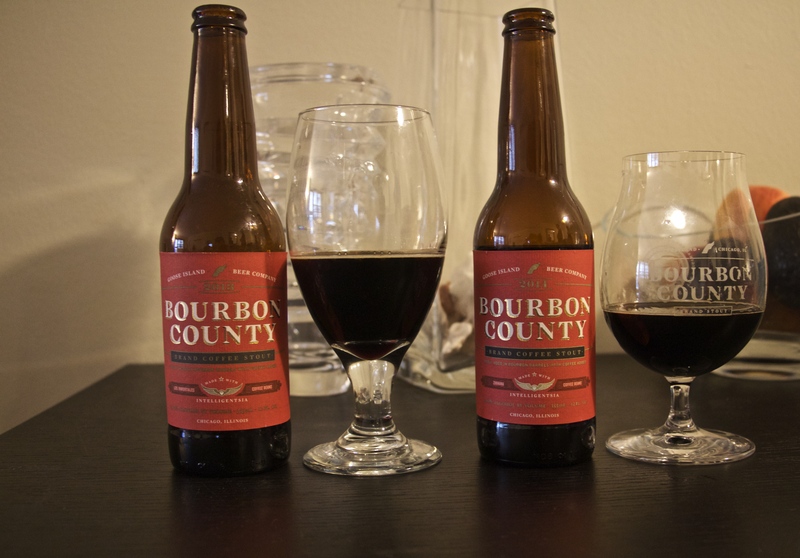 The 2014 batch of Bourbon County Brand Stout is as good as ever. The aroma is a smoky and roasty, along with buttery vanilla bourbon. Every taste has a nice balance of roasted malt, fudgy chocolate, dark dried fruit, vanilla, and caramel. The mouthfeel is thick and oily. It’s surprisingly smooth and drinkable even with the alcohol’s heat. It’s BCBS. It’s still one of the best. Everyday Goose Island smells the wonderful coffee roasting next to the brewery at Chicago’s Intelligentsia Coffee and Tea. This world-class roaster puts the same passion and skill into their coffee as Goose Island does with its beer. This excellent stout is made with a different coffee from the friends next door each year. With the change in coffee comes a change in the flavor profile, making each release truly unique from the previous years. The 2014 incarnation features Rwandan coffee. Available in four and 24-packs 12-ounce bottles nationally. The 2014 BCBCS has a huge coffee nose when tasted back-to-back with last year’s. The new batch smells as if the Rwandan Zirikana beans were just freshly ground and brewed right before opening the bottle. There’s no acidity from the coffee, just nice roasted coffee and chocolate flavors—a perfect iced-coffee beer. 2013’s El Salvador Los Inmortales coffee still has a great nutty aroma and flavor, even though it has understandably dropped off over the year. When tasting back-to-back, you get a great appreciation for 2014’s fresh, intense coffee aromas and flavors—I suggest drinking BCBCS as fresh as possible and if you plan on saving some, drink within a year or so. Pair both of these beers with nothing! Just enjoy the coffee. Aged in the third-use barrels that were once home to Kentucky bourbon and then the renowned Bourbon County Stout, this traditional English-style barleywine possess the subtlety of flavor that only comes from a barrel that’s gone through many seasons of ritual care. The intricacies of the previous barrel denizens – oak, charcoal, hints of tobacco and vanilla, and that signature bourbon heat – are all present in this beer. Hearty and complex, Bourbon County Brand Barleywine is a titan and a timeline; a bold, flavorful journey through the craft of barrel aging. Available in four and 24-packs of 12-ounce bottles. 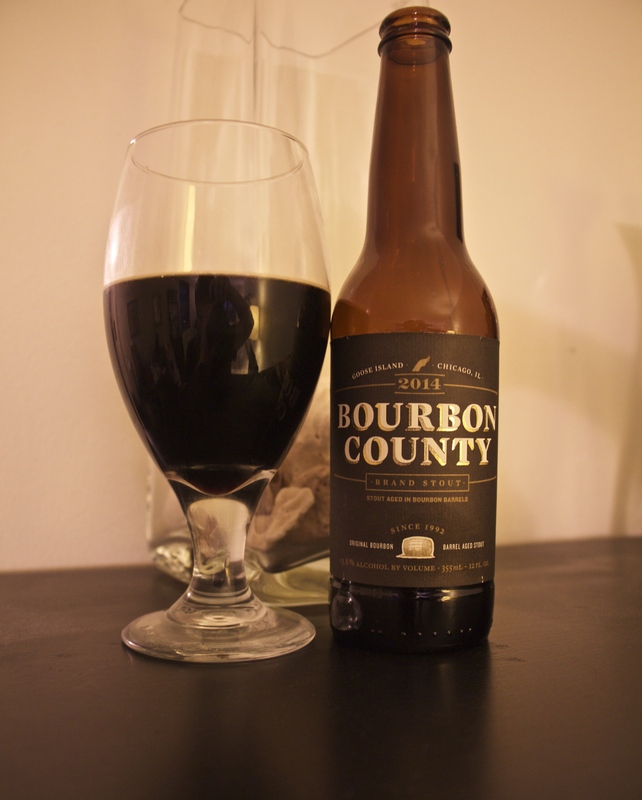 First brewed for the legendary festival of Wood and Barrel Aged Beer in Chicago, drinkers enjoyed this Bourbon County variant so much Goose Island bottled it the next year (2010). People flocked to stores to get their hands on a bottle and have this one of a kind barrel aged stout. Over the years that followed fans express their love for this version so Goose Island is extremely proud to bring it back in 2014. This year’s version features twist of aging the stout in Rye Whiskey barrels instead of bourbon hand-picked from four different distilleries. Each rye barrel features a two pound mix of Mexican and Madagascar vanilla beans. This limited Vanilla Rye will be available nationwide in 22-ounce bottles. After cracking the cap, vanilla aromas just burst from the bottle. The vanilla’s sweetness combines with the roasted malts and Rye Whiskey barrel to create nutty, rich chocolate flavor. 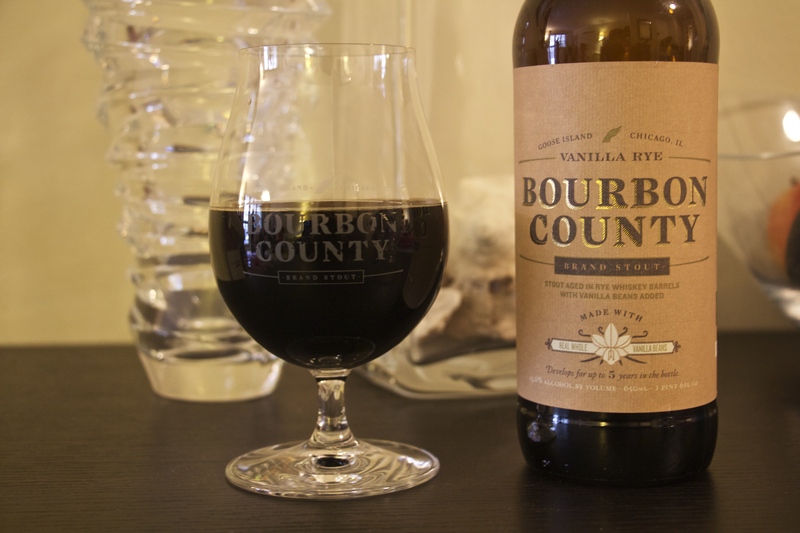 Like most of the Bourbon County line, this variant has a full, oily body. There is some significant heat from the alcohol, but the vanilla sweetness helps to smooth it out. I’m sure this will only get better with several months of cellaring. I’d suggest pairing with a dessert like biscotti to compliment, but not overpower the sweetness and vanilla of the beer.